The computer does not recognize the Walkman connected via USB and the battery does not charge. Please make sure to keep the terminals clean. 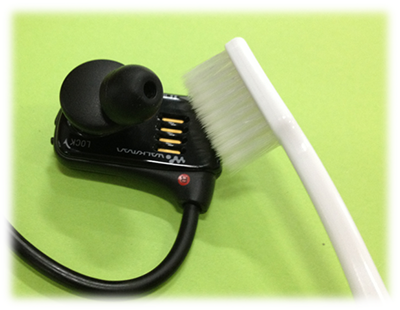 If Walkman terminal is dirty, clean the terminals using the soft bristle toothbrush (moisturized by water). Brush the terminals as gently, otherwise it may cause scratch on the cabinet. - Do not dry the Walkman using hot air from a hair dryer. - The cradle is not waterproof. Please do not wet the cradle. NOTE: When you use your Walkman for the first time, or if you have not used the Walkman for a long time, it may take a few minutes to be recognized by the computer, even if charging has already started (the operating lamp lights up in red). Check that the computer recognizes the Walkman after you have connected it to the computer for about 10 minutes. 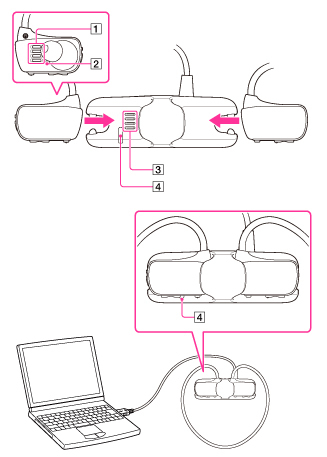 If you have followed the steps above and the OPR lamp does not light up to indicate that the Walkman is charging, service may be required.